"Ever since radio went commercial, a major problem has plagued its news commentators. Unlike newspaper columnists, most of them are hired or sponsored by advertisers; if a commentator's opinions disagree too violently with those of the sponsor who is paying the bill, that commentator is likely to find himself replaced by somebody else when his contract expires. Hence one of the most frequent complaints against radio—chiefly from leftist sources—is that opinion on the air tends to agree with the views of big business as represented by a fairly small group of advertisers." "Murrow's friends believe that his decision to give up the vice-presidency was brought to a head by the departure from C.B.S. 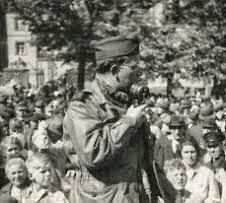 of Shirer, who had returned from Europe in 1940 to become a commentator in New York. Neither Murrow nor Shirer likes to talk about the affair, but the facts appear to be that Shirer's sponsor complained about his broadcasts, Shirer was shifted to an unsponsored program at a less desirable hour, and Shirer resigned. "Two or three newspaper columnists asserted that Shirer had been shifted because of his liberal opinions, and Murrow, as the official directly responsible for making the switch, came in for a good deal of criticism from the liberal benches. On the other hand, his supporters point out that if a sponsor objects to a commentator, the network can do little but substitute an acceptable one or lose the sponsor, and they contend that C.B.S. would have tried to find another sponsor for Shirer if he hadn't decided to quit. However that may be, Shirer's leaving must have been painful for Murrow, for after all Shirer was the original 'Murrow boy.'" The New York Times weighed in on the issue of sponsors in radio news in 1947, first with critic Jack Gould and then followed up by comment from the editorial board. 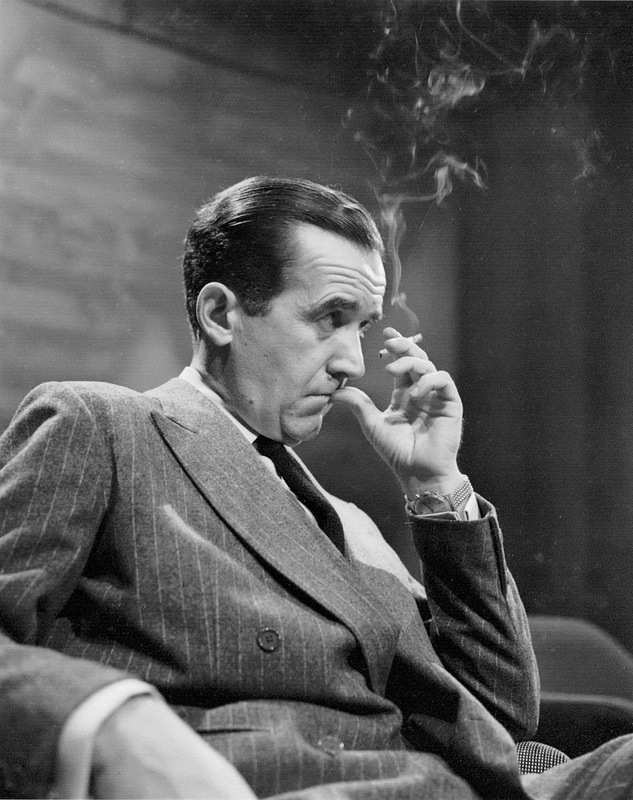 Before he left his position as vice president, Murrow responded with a letter defending CBS. These articles, including Murrow's response, are featured below. The widespread curtailment of broadcasts by liberal commentators, chiefly because they have not been able to hold their sponsors, again has brought to the fore the question of whether opinions on current events should be broadcast on a commercial basis. Dr. Frank Kingdon recently was dropped from the weekday schedule of WOR after his sponsor became dissatisfied with the time period at which he was heard. His separate Sunday program enjoying sponsorship, however, is continuing. WOR also refused last week to carry locally the new Mutual commentary series of F. H. La Guardia unless it was sponsored. The commercial evaluation of commentators also has prevailed on other networks. John W. Vandercook and Robert St. John no longer are heard on NBC and Quincy Howe has been dropped from CBS in New York, though carried elsewhere on the Columbia chain. Independent stations also have had their share of casualties among liberals who failed to meet the tastes of present or potential sponsors. This application of the acid test of commercialism to the presentation of opinion manifestly is unsound. In the last analysis, it results from the willingness of most broadcasters to relegate editorial comment to the competitive marketplace in the same manner as a daytime serial or any other radio "show." The consequences of this policy are only too evident. Primarily, it means that individual stations have surrendered to others their authority in perhaps the most critical and important field of their operation: the dissemination of news and opinion. Only recently one of the major conservative networks, at the behest of the sponsor, agreed to a complete change in format for a specific broadcast. The emphasis of the program was shifted from foreign to domestic issues and the old commentator replaced by a new one. The sponsor was pleased because the program's popularity rating improved and the network apparently was not disturbed over the fact that the appraisal of news values was being handled by a new entrant in the field of journalism—a manufacturer of patent medicines. The individual advertiser's insistence on a good popularity rating for "his" program devoted to commentary also has placed a premium on "the performance" which can catch the public's ear if not mind. It has been a natural incentive to the soap-opera journalism of Gabriel Heatter and patented emotionalism of Walter Winchell, Drew Pearson or Bill Stern. The sound and reasoned thinking so desperately needed in the resolution of today's issues is made secondary in such cases to the desire to win and hold larger audiences. Under the public license enabling him to be in business, the individual broadcaster is exclusively and solely responsible for what goes out over his wave length. Accordingly, he must be the one to assure a balanced presentation of all shades of opinion as the first principle of sincere operation in the public interest. And it is in his own conscience that he must find the answer to whether a balanced presentation means offering several commentators of conservative viewpoint five times a week at a choice evening hour and a liberal commentator not at all, as is now the case on one network. But it is difficult if not impossible to see how this essential and required independence of the individual station in news matters can be achieved so long as specific advertisers are associated with specific commentators. Certainly, in last year's automobile strike, it was an odd journalistic experience for the listener to hear that news of the industrial dispute war brought to him "through the courtesy" of a party to the dispute, an automobile manufacturer. Since then, in the case of both conservative and liberal speakers, inferences that this or that commentator is heard because he reflects a sponsor's beliefs have become commonplace in radio circles. Even though these rumors have not been substantiated, it would seem that broadcasting cannot much longer overlook their circulation. The logical remedy for this condition would be to remove opinion commentator from the realm of direct association with specific advertisers and make it the exclusive function of those trained and equipped to handle it, which in radio means the station licensee's own staff of reporters and commentators. Opinion and news on the air would then be vital ends in themselves and not subordinate to the advertiser's aims, which in themselves are wholly proper and legitimate but must be distinct from an entirely different pursuit: journalism. Under such procedure the commentator would have only one master—the station itself—and the only criterion of his success would be as a journalist, not also as a salesman. As a newspaper may permit advertisements in space adjacent to news columns, so, too, the appropriate place for radio commercials is either before or after a news or comment program. The context of the advertisement should be entirely free of any association with the editorial matter which comes before or after, the middle commercial having no more place in a commentator's program than an "ad" in the center of a newspaper columnist's article. It is the policy of a sharp separation of the functions of journalism and advertising which radio must put into effect if it is not to be plagued perennially by controversies over commentators. A contrary course in the long run can only jeopardize radio's reputation for impartiality in presenting news and opinion and, concurrently, its strength as an advertising medium. The sponsored program is a phenomenon of the radio industry for which no individual or set of individuals deserves credit or blame. Radio advertising just happened to develop in such a way that the sponsor's message customarily is related to and identified with a specific program content. This contrasts with the periodical and newspaper method, in which the advertiser is not related or connected with or concerned about the news and editorial messages with which his copy appears in juxtaposition. It is just as possible that radio could not have attracted in any other way the advertising investment to support the ambitious programming of modern broadcasting. At any rate, the burden of proving that radio can support itself by other means rests upon those who condemn the whole practice out of hand. This defense does not eliminate some particular criticisms of the general radio policy. The offensive commercial that appears in the midst of a music or drama program may be no more than mildly annoying. The relationship between a news or comment program and its sponsor may be something a great deal more serious. The advertiser, under these circumstances, has the power to take off the air part of the news and opinion a station furnishes. No newspaper would tolerate for a moment such control of its news and its opinions. The newspaper or magazine advertiser can take out his advertising, but he cannot take along with it the news, editorials or features alongside the advertising. As long as the radio advertiser has the power to do this, radio stations will face the sort of criticism they have had in the past few weeks as the result of the withdrawal of several commentators whose sponsors have quit. The issue is much broader than the fate of these particular commentators and newscasters. These episodes only serve to emphasize that the present method of sponsored news and commentators is open to some grave criticism. Advertisers are being permitted to say what news is to be put on the air and who is to put it on the air. The power and responsibility of such a choice is not properly put into their hands alone. Radio might well consider the precedent of the press and separate completely its commercial and news content. Jack Gould, discussing the problem in this newspaper's columns, has suggested entirely separate commercials before or after news and comment periods but without any sponsorship connection. This is one logical alternative to a system that casts doubt on the impartiality of stations and newscasters. Perhaps you will permit me to make brief comment on your column, "Commercial Comment," in The New York Times on Sunday, Jan. 5, and The Times editorial titled "Sponsored News" of Sunday, Jan. 12. As you must know, the system you advocate for the discharge of the broadcasters' responsibilities in news and analysis has been the established policy and practice of the Columbia Broadcasting System for many years. This network takes full responsibility for broadcasts of news and analysis transmitted over its facilities. The individual broadcasters are members of Columbia's staff, are paid by us and responsible only to us. We set aside periods of network time for news and analysis which are sold only to clients who will sponsor them as they are developed by CBS. Under no circumstances will we sell time for news and permit the sponsors to select a broadcaster who is not wholly acceptable to us or to influence the content of the broadcast. "Columbia broadcasts news programs solely for the purpose of enabling the listeners thereto to know the facts so far as they are ascertainable and so as to elucidate, illuminate and explain facts and situations as fairly to enable the listener to weigh and judge for himself—in other words, Columbia endeavors to assist the listener in weighing and judging developments throughout the world, but refrain, particularly with respect to all controversial, political, social and economic questions, from trying to make up the listener's mind for him." "Advertisers are being permitted to say what news is to be put on the air and who is to put it on the air. The power and responsibility of such a choice is not properly put into their hands alone." Of course it isn't and at this network it is not put into their hands at all. "Only recently one of the major conservative networks, at the behest of the sponsor, agreed to a complete change in format for a specific broadcast." Which network, Mr. Gould? Wouldn't it be more responsible and effective criticism if you were to name names? It is the practice in our News Room when we quote or comment upon an article in The New York Times or any other newspaper to designate the paper by name. We think we owe that to our listeners and to the newspaper concerned. Professional radio criticism, of which there is a woeful dearth in the United States today, can be a great force in elevating broadcasting standards. It will never become that force, however, unless leaders in the profession, like yourself, set the critical standard. This you have already done to such a degree that it is disturbing to note that you have advocated policies which are already practiced by this network without anywhere recognizing the existence of the policies or the practice. Furthermore, since you compare radio with newspaper journalism on a general industry basis, I too feel justified in making this comparison. A recent national independent survey which sought out the opinions of a representative sample of people found that the public attitude was that radio gave the fairest, most unbiased news as compared with the newspapers, two to one. The safeguarding and continual improvement of objective, accurate news and analysis on the radio is our goal, and specific criticism directed to that end is both desirable and necessary. "...We have a right to protest when critics do not differentiate between station and station, program and program..."
I should like to see people angry when they are angry at particular stations, particular programs, particular offenders, and not at all radio. The article that prompted Mr. Murrow's letter made these two chief points: (1) that the broadcaster should have sole control over what goes out over his wave length; (2) that news and opinion should be removed entirely from commercial sponsorship. The letter covers the first point but not the second. The difficulty with this approach to the program of sponsored news and comment is that the two cannot be so readily separated. The CBS contention that it has final authority over what is said on its facilities need not be argued. But this in itself does not mean that the advertiser is wholly without influence in regard to news and comment programs. As a matter of fact, he may exercise many influences which are antithetical to sound principles of journalism. Specifically, a sponsor of news or news analysis on CBS does not have the right to pick and choose among the analysts and newscasters on staff of CBS. This would seem almost the same as if an advertiser were permitted to say which member of a newspaper's staff should or should not be responsible for an editorial assignment. For example, Quincy Howe, CBS analyst, at present is heard at 6 P. M. on a sustaining basis over the network. Effective next month, however, the Metropolitan Life Insurance Company is scheduled to assume sponsorship of the period. According to CBS, the Metropolitan proposes to choose between two other members of the network's staff. The end result is that Mr. Howe will not continue to be heard at this choice time. Apparently up to now CBS has regarded Mr. Howe as eminently qualified to occupy the period at 6 P. M. or, it must be presumed, he would not have received the assignment. If so, why should he not be retained in that period whether or not a prospective advertiser happens to concur in the network's decision? Thus the advertiser, even though it be indirectly, decides when—and sometimes if—a commentator shall be heard, and therefore how large an audience he shall have. This condition in radio stems directly from the fact that programs of news and news analysis are sold in the same manner as any other radio "show." The fault does not lie with the sponsor, who is only following the perfectly normal practice of his interest—advertising. The fault does lie with the radio station for permitting this practice to be carried over into a field where it cannot be applied with propriety—journalism. There is another important point. The sponsorship of news by an advertiser affects the actual compensation received by the man who presents his views over the radio. Though his work be precisely the same in both cases, the commentator under commercial sponsorship as a rule receives several times as much pay as he does when heard on a sustaining basis. Even in straight news programs, the present juxtaposition of editorial copy and advertising on the radio is unwise in principle, if innocent in practice. On the morning of Jan. 17 over WCBS, for instance, a news broadcast sponsored by a milk concern dealt at considerable length with the price of milk. This is not even to suggest that specific sponsors are editing or tampering with specific news broadcasts or specific opinions of commentators. But it is primarily important that the public should have every confidence in radio's independence in presenting the news. Citation of a poll financed by the National Association of Broadcasters, the results of which have been disputed by numerous other surveys, hardly seems the ideal means to achieve that end. The sounder course is to divorce news and opinion from advertising entirely, so that the listener will have no grounds for suspicion of radio's integrity.